Antares Falling will be on a virtual concert as a part of the Ball State University Festival of New Music from March 17-19th. Triadic Light will be performed at the Ball State University Festival of New Music on March 17th at 7:30pm. Afterimage will be premiered by Christopher Anderson at the NASA 2016 Biennial Conference on March 11th at 3:40pm at the St. John's Church. Antares Falling will be performed as part of the College Music Society Conference Plains Chapter Composers' Concert on March 6th at 7:30pm at the University of Missouri-Kansas City. Antares Falling will be performed as part of the NewEar Ensemble's Season 23 concert on November 21st at 8pm in St. Mary's Episcopal. Ashley will be teaching music theory as a lecturer at the University of Illinois, Urbana-Champaign. Ashley's new work Revolve for saxophone quartet will be premiered at the World Saxophone Congress & Festival on July 10th at 5pm in Salle 24, Cite de la musique et de la danse in Strasbourg, France. Zach Nyce performs Meta-Meta as part of New Music From Bowling Green at Trinosophes in Detroit on April 18th, 8pm. Triadic Light will be performed by Zeca Lacerda in the Bryan Recital Hall of Bowling Green State University on April 3rd at 8pm. Triadic Light will be performed by Zeca Lacerda in the Kulas Recital Hall of Oberlin Conservatory on March 19th at 8pm. Ashley has been selected as the winner of the 2015 MACRO composition competition for Current. She will be giving a presentation in Wisconsin on May 30th. Nicolas Horvath performs Meta-Meta in the Museum of Skarbiv on December 31st in Kiev, Ukraine. Ashley gives a guest lecture on her music and a master class for the composition student at the Ching-Sui High School on December 30th in Taichung, Taiwan. Ashley gives a guest lecture on her music at the National Taiwan Normal University on December 15th in Taipei, Taiwan. Lost Touch With Oneself will be performed as part of the Asian Composers League Taiwan concert on December 7th in Taipei, Taiwan. Antares Falling will be performed at the 2014 Bowling Green New Music Festival on October 17th at 10:30am in Bryan Recital Hall. Autumn will be premiered by Trio 114 as part of the Intercultural Connections projects supported by the Urbana Arts Council. The concert is on September 28th at 4pm in the Garden Pavilion in the Meadowbrook Park. Illusional Control will be premiered by the Alarm Will Sound at the Missouri Theatre on July 26th at 7:30pm. Lost Touch With Oneself will be performed at the Errant Bodies project space on June 14th in Berlin, Germany. Antares Falling will be performed during the 35th Annual Bowling Green New Music Festival from Oct. 15th-18th. Antares Falling will be performed by the Locrian Chamber Players on May 29th at 8pm at Riverside Church in NYC. Meta-Meta, commissioned by Nicolas Horvath, will be performed on Apr. 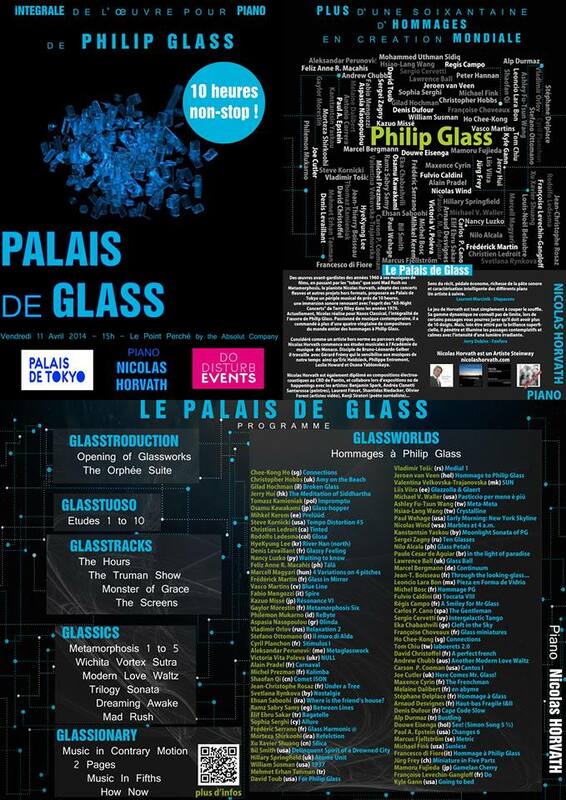 11th at 3pm as part of the GlassWorlds Homage Project at the Palais de Tokyo Museum, Paris, France. Check out some articles on The Guardian, Piano Bleu and Inactuelles. Current will be performed by Alex Rowney on Apr. 6th at 4pm at the PianoForte Foundation in Chicago, IL. Tickets are available here.